On Holy Thursday we commemorate the Last Supper Jesus ate with his disciples in the Upper Room. We recall both the institution of the Eucharist and Jesus washing the feet of the disciples. These paired images, the gift of self in the Eucharist and the gift of service in the footwashing, give us a model for discipleship as Jesus said, "Do this in memory of me." 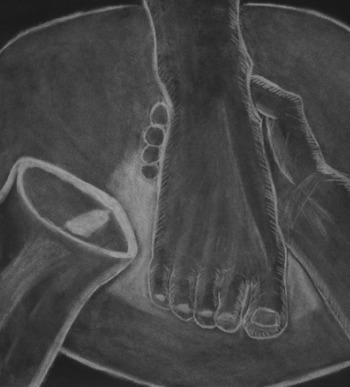 If you are interested in learning more about our Rite of Footwashing celebrated during our Holy Thursday Mass of the Lord's Supper, have a look at the explanation of the the history and the deeper meaning of the rite below.